Servicing the United States and Canada with special Waterproofing Systems, Methane Vapor Barriers, Pollution Vapor Barriers, and Brownfield. Contractors Waterproofing has grown from a small market residential waterproofing company into a premier international specialized waterproofing contractor and one of the largest brownfield mitigation vapor barrier installers in the country. "When we first heard about this process I was skeptical. No One had any idea what this was about or who you were, After spending some time checking out the product and getting comfortable with you I was very pleased with how well you and your company fit in. You were very patient with all of the meetings and very informative. Without your input we would not have had the right equipment on the job. With your input we were able to create a process that was very smooth. I think the following statement from our project manager says it all, "...I had no issues with Mike and his work. He actually got done quicker than was expected so we could complete in two pours instead of three." If anything like this ever comes up again you will be my first call. We have the project experience, the project references, the products, the insurance, the bonding and the funding to successfully complete your waterproofing or brownfield project. If you need to put a stucture down into polluted water we are the ones to call. 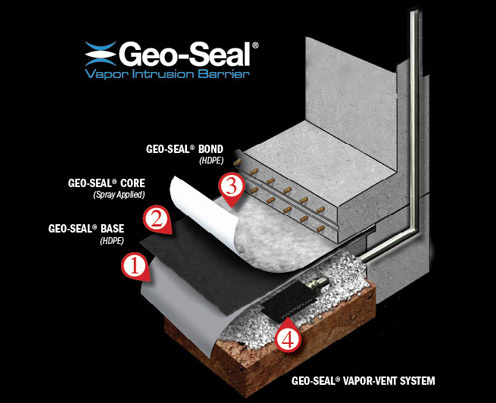 Contractors Waterproofing was the 1st applicator in the world to use and install the Geo-Seal system from Land Science Technologies and Contractors Waterproofing continues to be the largest Geo-Seal installer in the country. Copyright © Contractors Waterproofing. All rights reserved.